We’ve had nasi lemak burgers and Old Chang Kee’s chicken rice puff taking the country by storm. 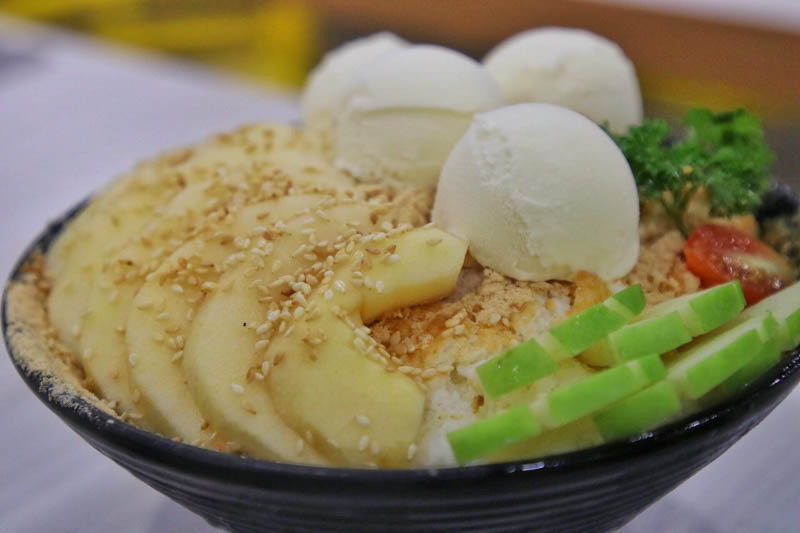 But what about Nasi Lemak Bingsu, Assam Laksa Bingsu, or even Hainanese Chicken Rice Bingsu (S$7.90 each)? Available at selected Kopitiam outlets, these new Singaporean bingsu flavours are sure to draw some adventurous souls. Since I love trying new dishes, I had to give these unique creations a shot. I tried the Hainanese Chicken Rice Bingsu (S$7.90) and sadly, my first glimpse of the bingsu already left me disappointed. It looked nothing like what the poster promised, and it definitely didn’t look like chicken rice. Even though it’s inspired by Hainanese chicken rice, this was still a sweet dessert. 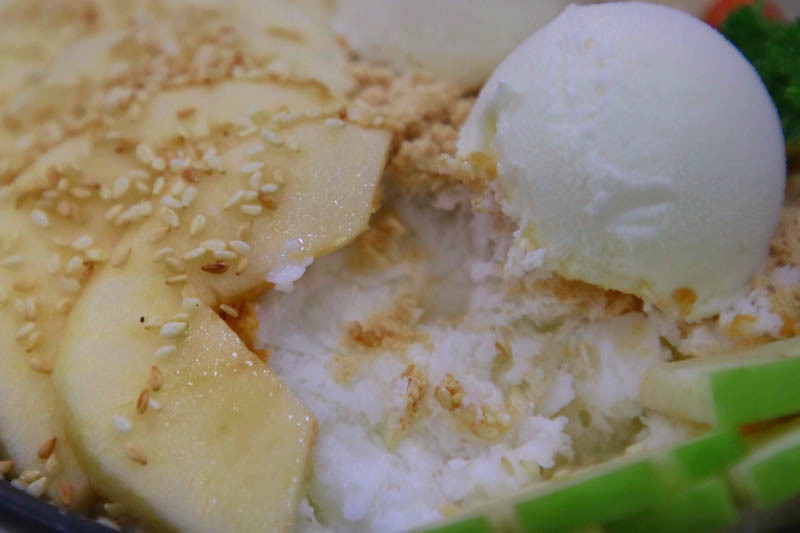 The usual chicken rice balls were replaced by ice cream and shaved ice, while the “chicken” came in the form of apple slices. If you’re looking for the cucumber pieces, the green apple slices are probably supposed to stand in for them. Served with strawberry sauce and sesame sauce on the side, the chicken rice experience is now complete with the “chilli sauce” and “minced garlic”. The combination of the roasted salty sesame sauce and the milky shaved ice tasted funky and I didn’t really enjoy it. When I think of bingsu, I think of a really sweet dessert that can satisfy my sweet tooth. 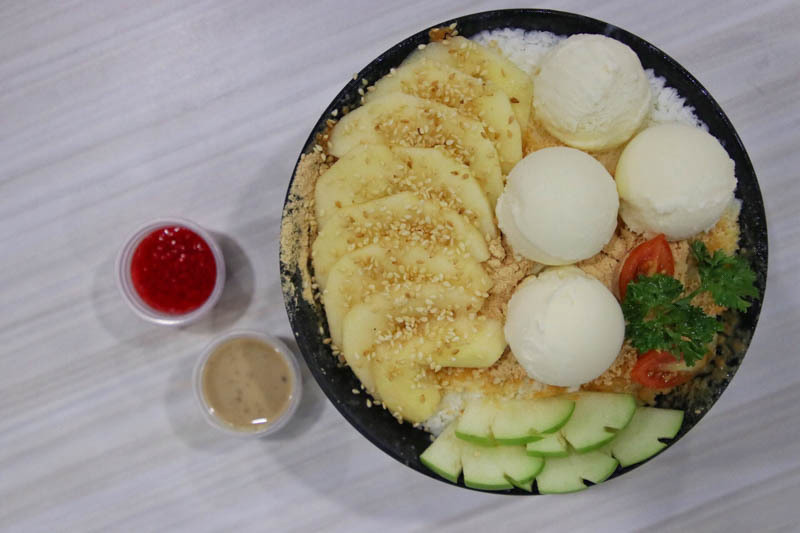 Although the shaved ice in this Hainanese Chicken Rice Bingsu had a subtle milky sweetness, the strong tart taste of the apples overwhelmed that sweetness. Overall, the sweet, salty and sour flavours of the bingsu combined to form a very weird and foul tasting blend. This Hainanese Chicken Rice Bingsu was neither aesthetically pleasing nor appetising. Hence, I would not recommend spending S$7.90 on this, and I would rather stick to my Oreo bingsu.